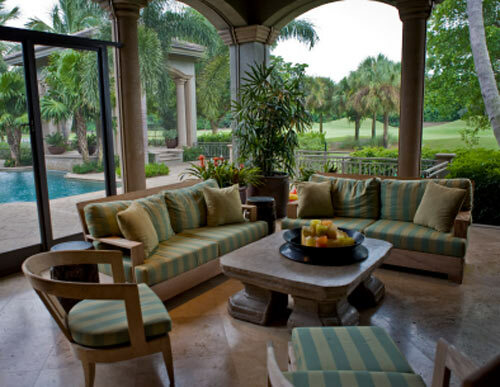 Here we are in sunny Florida where we want to have that outdoor living that we moved here for. Part of that includes entertaining, or just being able to cook dinner outside under the stars. The temperature is 67 degrees, you have your grill warm and ready, the food is ready to be prepped, the sizzle of the meat hitting the grill roars as it hits the hot grill. You want to wash the salad and veggies so you can cook them outside. This is all possible if you have an outdoor kitchen or simply a fire pit with a sitting area around it to enjoy with friends, or even just to curl up next to, with a good book. Fire pits have become such a big part of our outdoor living; they change the entire atmosphere to an evening. You could also have a roll out canopy overhanging to add a little shade if desired during the day, add an outdoor shower, or you could update the pool colors. Well, this dream may not be as far-fetched as you think. So now let's recreate the scene: It is 65 degrees out the sky is dark with the stars beaming against it and the crickets are singing. The doors are open, you have some soft jazz playing in the background, the candles are lit, you open a bottle wine, you heat the grill the smell permeates the air, the veggies are sautéing on the burner, potatoes are cooking on the grill, You set the table, with the dishes from the cabinets outside, you lounge around the pool waiting for your dinner to cook. You sit and enjoy a delicious dinner, with the light from the fire pit flickering and the soft landscape lighting allowing an amber glow. You finish dinner, load the outdoor dishwasher and when go back inside, there is no smell of food, no dishes to do and you feel totally relaxed, as if you were on your own little private mini vacation. For that short time you were relaxed, free, and didn't have a care in the world. Spa and pool construction and updating is another item that many homeowners are not really sure how to handle. A simple update to these items can make a big difference to the appearance of the lanai. Adding a spa to an existing pool is an option depending on the existing layout. Just remember we all live in Florida for a reason, so we may as well enjoy it.